A few years back the Umarex SA177 disappeared off the face of the earth, well not really, it simply juts stopped being made and fairly quickly retailers ran out of stock... As with anything that people want but can not get any more, the demand went up and all of a sudden everyone seemed to want to get their hand on an Umarex SA177 Blowback BB Pistol. So that brings us to now. 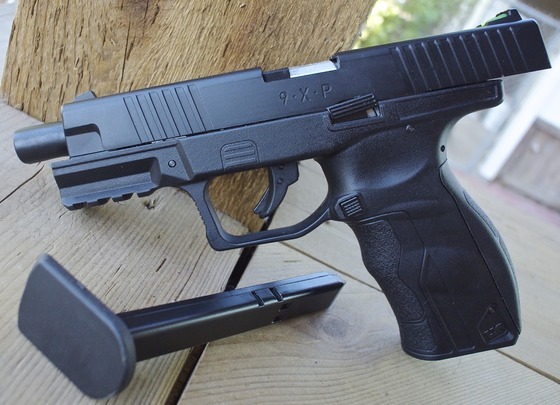 And a new gun on the market called the Umarex 9XP that in many ways is a lot like the SA177 but with a slightly new skin on it, one that differentiates itself a bit more from the traditional Glock look. Sure the Umarex 9XP Blowback BB Pistol has a some Glock looking properties but it am guessing it has enough subtle changes to make the lawyers over at Glock HQ happy enough to allow Umarex to again sell an airgun very similar to the SA177. Internally and mechanically as far as I can tell the Umarex SA177 and Umarex 9XP are the same and so they should both perform very similarly too each other and with pretty much all the same specifications. Even the magazines seem to be interchangeable! The trigger and trigger pull look to be identical and even the slide catch release are modeled after each other. Again, the only difference are some minor cosmetic changes to the metal slide and polymer frame. So if you have been looking to get your hands on an SA177, well the next best or perhaps even better airgun is now available in the new Umarex 9XP! And the price is all right too!